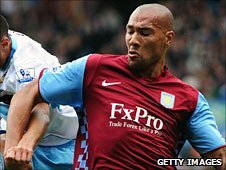 Aston Villa striker John Carew has joined Stoke City on loan for the rest of the season. The Norway international had medicals at both Stoke and West Bromwich Albion but has opted to join the Potters. Carew, 31, is out of contract at the end of the season at Villa, who have signed Darren Bent from Sunderland. He looks set to replace Jamaican Ricardo Fuller in Stoke's squad after they accepted a £3m bid from Sunderland for the player. "If I'm happy and the club is happy, if I enjoy it and it goes well enough, then we can decide that in the summer," said Carew on the prospect of making his switch permanent. "The important thing now is to make the most of this opportunity. I'm looking forward to the challenge and I am happy to be here. "Although I had other offers, I saw Stoke as the best team and the strongest team, so this is a great chance for me to join a side fighting in the top half of the table. "[Manager] Tony Pulis has shown great confidence in getting me here so I want to repay that faith. "He's a great manager who created a big impression with me, so I am delighted I have been given this opportunity to work with him." The club finalised Carew's paperwork on Friday in time for him to be included in the squad for Saturday's Premier League trip to Fulham. "This is a fantastic signing," Pulis told Stoke's website. "John's record speaks for itself because he has scored goals at the highest level throughout his career. "On top of that, he was Aston Villa's leading scorer last season with 17 goals, so we have acquired a striker with an outstanding pedigree." Stoke chairman Peter Coates told BBC Sport: "He [Carew] has got a good record and could be very valuable to us between now and the end of the season. "We'll have a good chance to get a look at him and he'll have a good chance to get to know us. It's a good opportunity and it's nice that someone like him wants to come to the club." Carew arrives at the Britannia Stadium after Stoke indicated on Thursday that they do not expect Senegal striker Demba Ba to join from German club Hoffenheim. The 25-year-old had agreed personal terms and was set to sign for about £6m but failed a medical last week. "He's not fit to play right now and we want players that can play right now, come in and make an impression, and I don't think he's in a position to do that," said Stoke assistant boss Dave Kemp. "That's not to say the deal couldn't be resurrected some time in the future, but I don't think it will be done in the foreseeable future." Carew joined Villa from Lyon in 2007 and was a key member of their side under former manager Martin O'Neill. But injury has prevented the striker from making an impact this season, while his relationship with O'Neill's successor Gerard Houllier has been strained, with the pair arguing in the press in 2010. Carew called Houllier "disrespectful" after the Norwegian was challenged to earn a new contract, with the Villa boss responding by calling the former Valencia man "stupid" and telling him to stop "living in the past". Despite falling out of favour under Houllier, Carew was a surprise starter in the Midlands derby with Birmingham last weekend. Stoke are eighth in the Premier League but their top scorer Kenwyne Jones has only scored five league goals from 21 starts while Fuller, Jonathan Walters, Tuncay and Eidur Gudjohnsen have also struggled to find the back of the net with any regularity. Meanwhile, Coates confirmed Birmingham striker Cameron Jerome is also a possible transfer target. Coates said: "He's a player we like and something might happen. We're not sure, we'll have to see and perhaps it will become clearer next week."